To quote that ever-energetic Scot, Craig Ferguson: hello, my lovelies! What we’ll cover this time around are a few site enhancements that you may have noticed popping up over the course of the last week, a few juicy news tidbits, and of course we’ll mention this week’s Editor’s Pick and our featured author. As I mentioned in my previous post, I’ve rolled out a few changes to the way users interact with the Protagonize ratings system over the last few days. Many of our regular users have likely seen and started using these new features already, but hopefully this will give everyone a clearer idea of how things work and the reasoning for the changes. Each star is worth 20% of your rating, which means that there’s a big gap in between a 4-star and a 5-star rating. Adding a half-star breaks each possible score into 10% chunks, which adds some precision to the rankings and removes the fuzziness between potential scores. Users tend to actually be biased towards the top 3 ratings in a 5-star system, with 1-star and 2-star ratings being extremely rare, and the average rating being close to 4. The data I’ve gathered on Protagonize over the last 7+ months very much confirms this notion. Adding half-stars allows for more meaningful ratings across the board, with at least 3 more valuable data points within that oft-used 2.5-5-star range. We want to encourage users to use both ends of the ratings spectrum, and more meaningful ratings and descriptions of what each rating entails should help with that aspect of it. As you may have gathered from my last point above, another addition to the system that you’ll notice is more elaborate descriptions of what exactly each rating means. This shows up in the form of tooltips as you hover over the possible ratings, providing a little clarification as to how you should go about deciding what to rate a chapter or branch. These are intended to guide you into rating items a little more precisely; I’m hoping that will help our authors gain more valuable insight into the way their writing is perceived by others. For stories, you can toggle between the ratings breakdown for the chapter or branch you’re reading, or for the entire story. For author profiles, you can see the author’s all-time ratings breakdown, as well as their ratings over the last seven days. 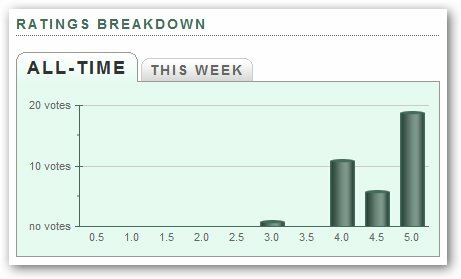 Note about the new charts: The ratings breakdown charts require that you have the Adobe Flash Player 9 plugin installed in your browser. You should be prompted to install it if you don’t already have it, but if you can’t see the prompt, you can download the plugin directly here. You may have noticed that I haven’t removed the ability to vote on your own posts — yet. I’ll give our current, modified system a chance before I go the extra mile. I’m still not convinced that removing the ability to rate your own work will have a positive impact on the ratings ecosystem. Those two sites provided some excellent insight into ratings systems in general (especially Christopher Allen’s blog, Life With Alacrity — it’s truly a goldmine of ratings and other collective intelligence-related material), which I was able to apply to our existing system without veering too far in another direction, as I had previously discussed. I think this set of changes was less extreme, and I’ll evaluate any improvements in quality and quantity of ratings over the next month or two. This week’s Editor’s Pick is “Letters for Lucy” by adnamahc, and our featured author is Bucknuck. Congratulations to both authors, and thanks again for your excellent contributions this week! To our new Protagonists: if you’re unfamiliar with how Protagonize features work, I wrote a little overview a couple of months ago that should cover the bases. New picks go up on the site every Monday, so make sure to check back regularly! You may have noticed that I’ve been quieter than usual on the site over the last couple of weeks; the reason for this is we’ve been dealing with a bit of a family emergency at home, as a close family member has taken quite gravely ill. If you were wondering what might be keeping me away from the site, that’s the gist of it. Don’t worry, though — I’m still going to be around and making changes to the site regularly, but I may be a bit distracted over the coming few weeks; so please, bear with me in the meantime. This entry was posted in Editor's Picks, Features, General, Miscellaneous, Site mechanics and tagged breakdown, charts, Editor's Picks, Features, half-stars, ratings. Bookmark the permalink. I’ll be remembering you as you care for your family emergency. By the way … you do exquisite work. Thanks for the kind words, Jim. I appreciate it. The graphs are great Nick. Best wishes to you and your family. I like it. All of it. I’m going to rate every single thing that I read from now on, and if I leave a 2 or below I’ll explain myself.